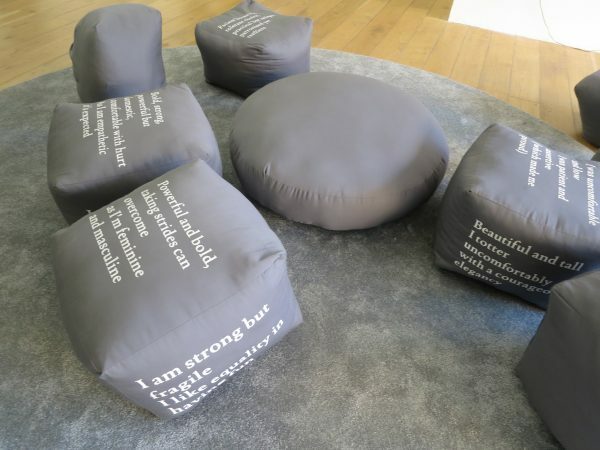 Text on cushions written by women from the Loudspeaker programme at Nottingham Contemporary. I deliver the Loudspeaker programme and facilitated the women who are currently attending in producing this text for gallery cushions for ‘Still I Rise: Feminisms, Gender, Resistance’. The exhibition runs until 27th January 2019. ‘We are a wide variety of women from different walks of life. We come to weekly workshops to create and interpret art, taking steps to be stronger more resilient women. ‘We’ve got our work in the museum. It’s weird. There’s proper artists and then us. We are just basic everyday people. This is giving us a voice, not just the artists’. Loudspeaker participant. The Loudspeaker programme is delivered as part of the Opportunity and Change project which is funded by the European Social Fund and the National Lottery, through the Big Lottery Fund.